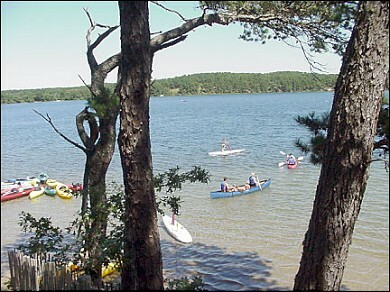 One of the larger ponds in Wellfleet, Gull Pond has a nice shady beach and warmer waters. There is an onsite boat rental. A great spot if you are looking to explore some of the non-ocean waters. Parking is available with sticker. This pond was best for swimming with a toddler. His parents raved about it. Lecount for the ocean (the dog especially loved that one), and Indian Neck and Mayo beach were also great - lots of options in Wellfleet. A fresh water pond with a sandy beach that is a perfect spot for young children.Our granddaughters,ages 4&6,loved swimming there!